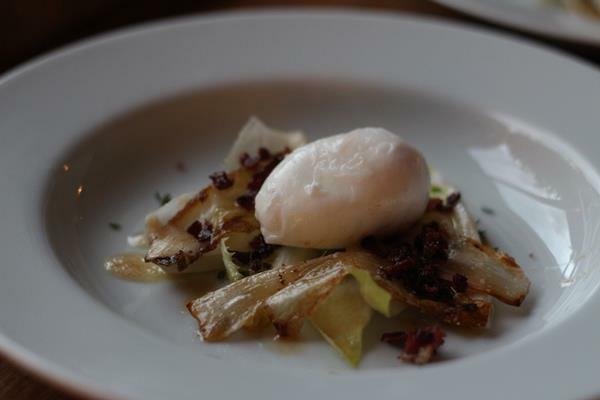 I made this dish of Poached egg with endives, bacon, butter and thyme a few weeks ago. It turned out great but was suppose to be something else from the beginning, see how one idea can turn into something different and how this sometimes can be a great way to learn new things. A few weeks ago I had decided to make Frisée aux Lardons, this is a classic French bistro dish that is very tasty and simple. It’s frisée salad, lardon which is fried salted pork and a poached egg. A great dish that you should try if you haven’t before. But what happened was this. When I came to my local store they didn’t have any Frisée, and they were out of lardon. So what to do? I decided to use what I could find instead, egg was not a problem. And replacing the lardon with some smoky bacon wasn’t a tough choice either. But the frisée was trickier, you see frisée is a crisp and quite bitter salad and most salads are softer or less bitter. After a while I went for some endive salad. 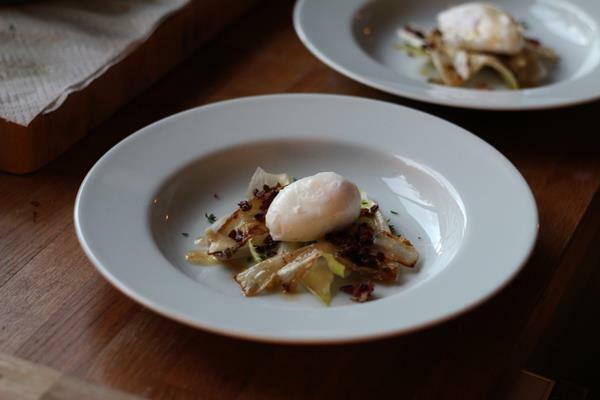 And now my idea was to make a Endive salad with crispy bacon and a poached egg. So I started making this and cracked the eggs into bowls in preparation of the poaching and fried the bacon in a pan to make it crisp. 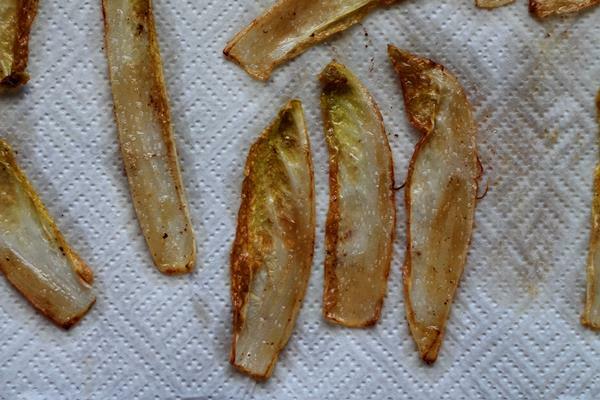 Then is was going to start to chop the endive when I noticed I had a pan of hot bacon fat so I decide to fry the endives. I removed each leaf separately and fried it in the bacon on low heat. The endives turned out great but now I lacked texture to the dish so some of the endives was chopped down and served raw. I also discarded the leftover bacon fat and added some butter to the pan and heated it into a beurre noisette and added some fresh thyme. This left me with a dish of Poached egg with Endives, Bacon, Butter and Thyme instead of my intended Frisée aux lardons. I love when things like this happens and my advice to anyone who likes to learn new things in the kitchen. When you can’t find that special ingredient or get an idea while making something else just go with it. It will make you expand your knowledge and learn more than you intended. I was set out to make a classic dish but made my own new thing instead. The dish is nowhere near perfect but the taste was great and all guests liked it. And it leaves me with something new to keep working on, way more interesting and fun than just making someone else’s classic right? And yes sometimes you will fail miserably but so what? There is always pizza a phone call away. Below is the recipe for the dish, good luck. First combine the vinegar with 3 parts water in four small bowls, then carefully crack one egg in each bowl and set aside. Leave the eggs there until poaching. 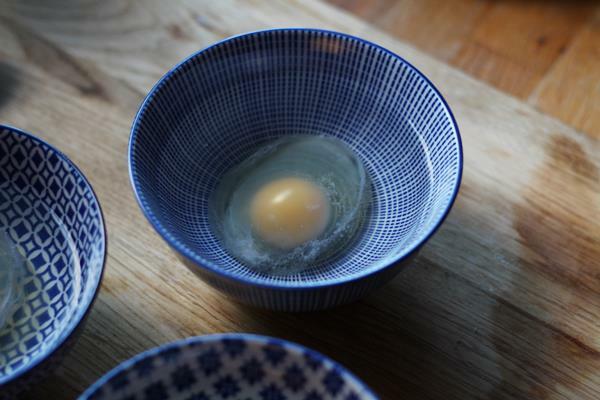 The acid in the vinegar will make the egg coagulate a little bit and the will be slightly firm when the are transferred to the boiling water when poaching. There are many ways to poach an egg but this is my preferred way. Bring some water to a boil in a big pot. Fry the bacon crisp in a pan, remove the bacon and chop it into smaller pieces. Cut off the root of the endive and remove eight leaves from the endive. Fry the endives on medium temperature in the pan you used for the bacon with the fat left in, season with salt and pepper. Be a bit careful with the salt since the fat is a bit salty from the bacon. Chop the rest of the endive in smaller pieces. Discard the bacon fat from the pan and add the butter, heat the butter until it get silenced and light brown in color, set aside and leave to cool a bit. This is called beurre noisette, browned butter and has a nutty roasted flavor that is amazing. Add the thyme to the butter, be careful because this can make the butter react and spray some butter at you. Lower to temperature of the boiling water to a slow simmer and carefully add the eggs, a almost lower to bowl so each egg can slide slowly out of the bowl and into the water, poach for about 3-4 minutes. You can lift out one egg after a minute or two and carefully feel if the yolk are soft or hard by poking it with a finger. You want it soft of course. Plate the dish, start with the raw and fried endives, sprinkle with bacon and put the egg on top, then add the browned thyme butter. Serve, good luck.